This is a long article, so I will attempt a summary for the impatient ones in the group. The original journal article is available online, but you have to pay for it unless you have a library account with a library that will pay for you. There is a negative correlation between higher IQ and religious belief. That is, if you are more intelligent, you are less likely to have a religious belief. Intelligence was defined as analytical intelligence - the “ability to reason, plan, solve problems, think abstractly, comprehend complex ideas, learn quickly, and learn from experience”. If religion was defined as participation, the correlation was not as strong as when religion was defined as belief. That is, people attend religious functions for other reasons than belief - duh. However, the authors also examined other aspects of a person's life. The lack of religious belief may be the result of the person with higher intelligence having other sources outside of religion for quality of life. A sense of control is more likely when someone is successful and intelligent people are more successful. The same is true for self-regulation, self-enhancement and social attachments. Higher analytical intelligence is also correlated with higher scores in all of these areas. So intelligent people do not need religion to supply any of these attributes. Caveat - "correlation does not imply causation." Recite in a sing-song voice three times. But it is interesting that the correlation exists. I'm sure additional studies will be made by theists and nonbelievers and by people who are attempting to be impartial. Euripides was not an atheist and only used the word “fool” to provoke his audience. But, if you look at the studies conducted over the past century, you will find that those with religious beliefs will, on the whole, score lower on tests of intelligence. That is the conclusion of psychologists Miron Zuckerman and Jordan Silberman of the University of Rochester and Judith Hall of Northeastern University, who have published a meta-analysis in Personality and Social Psychology Review. The three psychologists have defined intelligence as the “ability to reason, plan, solve problems, think abstractly, comprehend complex ideas, learn quickly, and learn from experience”. In short this is analytic intelligence, not the newly identified forms of creative and emotional intelligence, which are still subjects of dispute. In the various studies being examined, analytic intelligence has been measured in many different ways, including GPA (grade point average), UEE (university entrance exams), Mensa membership, and Intelligence Quotient (IQ) tests among others. Religiosity is defined as involvement in some (or all) facets of religion, which includes belief in the supernatural, offering gifts to this supernatural, and performing rituals affirming their beliefs. Other signs of religiosity were measured using surveys, church attendance, and membership of religious organizations. 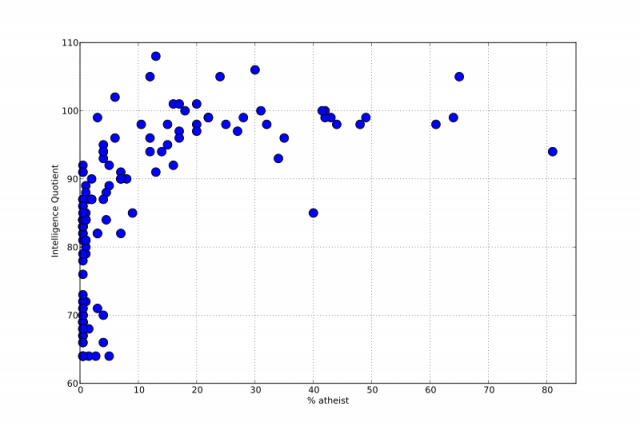 Among the thousands of people involved in these studies, the authors found that gender or education made no difference to the correlation between religiosity and intelligence. However, age mattered. The negative correlation between religiosity and intelligence was found to be the weakest among the pre-college population. That may be because of the uniqueness of the college experience, where most teenagers leave home for the first time, get exposed to new ideas, and are given a higher degree of freedom to act on them. Instead, in pre-college years, religious beliefs may largely reflect those of the family. Is there a chance that higher intelligence makes people less religious? Two sets of large scale studies tried to answer this question. Third, religion provides self-enhancement. A 1997 meta-analysis compared the intrinsically religious, who privately believe in the supernatural, to the to extrinsically religious, where people are merely part of a religious group without believing in God. The intrinsically religious felt better about themselves than the general public. Similarly, intelligent people have shown to have a sense of higher self-worth. Again, intelligence may be providing something that religion does. Last, and possibly the most intriguing, is that religion provides attachment. Religious people often claim to have a personal relationship with God. They use God as an “anchor” when faced with the loss of a loved one or a broken relationship. Turns out intelligent people find their “anchor” in people by building relationships. Studies have found that those who score highly on measures of intelligence are more likely to be married and less likely to get divorced. Thus, intelligent people have less need to seek religion as substitute for companionship. Zuckerman also warns that, despite there being thousands of participants overall ranging among all ages, almost all of them belong to Western society. More than 87 percent of the participants were from the US, the UK, and Canada. So after controlling for other factors, they can only confidently show strong negative correlation between intelligence and religiosity among American Protestants. For Catholicism and Judaism, the correlation may be less negative. There are countries below 80 IQ? Isn't that functionally retarded? As in the majority of people in the country are retarded? I believe that there are plenty of very intelligent people who are religious. I'm not sure if "The three psychologists have defined intelligence as the “ability to reason, plan, solve problems, think abstractly, comprehend complex ideas, learn quickly, and learn from experience”. In short this is analytic intelligence, not the newly identified forms of creative and emotional intelligence, which are still subjects of dispute. In the various studies being examined, analytic intelligence has been measured in many different ways, including GPA (grade point average), UEE (university entrance exams), Mensa membership, and Intelligence Quotient (IQ) tests among oersth." was properly applied to this study. I find religion is specific to your brain and the genetic/chemical makeup of said brain. I believe there is more than enough scientific studies/information on the web which counters this idea that intelligence determines if you are religious or not. IQ is cultural. Even translated to your native language, a standard IQ test makes no sense if you have never attended school beyond the equivalent 3rd or 4th grade and you have spent most of your life subsistence farming. So, yeah, some countries that have a very low education rate and are very poor, would collectively score very low on an IQ test that was developed for an industrialized nation.